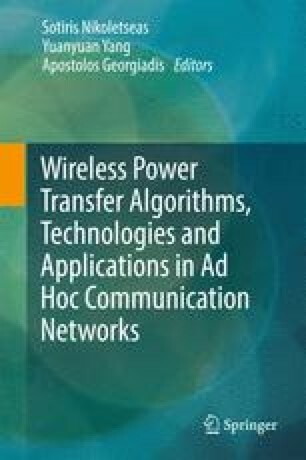 In this chapter we investigate the problem of wireless power transfer in mobile ad-hoc networks. In particular, we investigate which traversal strategy should a Mobile Charger follow in order to efficiently recharge agents that are randomly and dynamically moving inside an area of interest. We first formally define this problem as the Charger Traversal Decision Problem and prove its computational hardness. We then define a weighting function which evaluates several network parameters in order to prioritize the nodes during the charging process. Based on this function we define three traversal strategies for the MC; a global-knowledge strategy that uses an Integer Linear Program to optimize its trajectory; a global-knowledge strategy which tessellates the network area and prioritizes the charging process over each tile; a local-knowledge strategy that uses local network information collected and ferried distributively by the moving agents. We also evaluate two naive zero-knowledge strategies; a space-filling deterministic one in which the MC systematically sweeps the network area and a randomized one in which the MC performs a blind random walk. We evaluate these strategies both in homogeneous and heterogeneous agent distributions and for various network sizes with respect to number of alive nodes over time, energy distribution among the nodes over time and charging efficiency over distance traveled. Our findings indicate that network agnostic strategies are sufficient in small networks. However, as the network scales the use of local distributed network information achieves good performance-overhead trade-offs.